The band has a library of about 1000 songs and can provide swing music of the 30s and 40s, contemporary sounds and popular dance styles including fox trot, rhumba, mambo, samba, cha cha, waltz… Every client is consulted to ensure a customized performance including special song requests and dance sets. A fully equipped and prepared unit is provided which includes lighting, sound system, keyboard, music stands and the ability to provide recorded music during breaks. Guidance on planning an event can also be provided. Below is all the information you need to know about booking the band. Contact us for more information or to book right now! An 18-piece band can seem imposing, so big it will dominate your hall. Not so. While we can spread out (and enjoy the opportunity), we play very comfortably in smaller venues such as Hermann’s Jazz Club, various golf clubs, home weddings on the patio, etc. We tailor our sound accordingly; never too loud. The comfort of your guests is important to us! Here’s an ideal band set-up… click here. Shown below are typical rates. Each event is unique. Special pricing and consideration may apply for New Year’s Eve, special charity or community events and national or international conventions. Contact us to discuss your needs! The Commodores Big Band can provide a solo piano for cocktail hour, dinner etc. Please contact us for more information on this or any aspect of booking the band. $300 deposit (deducted from total engagement fee) required for each booking. 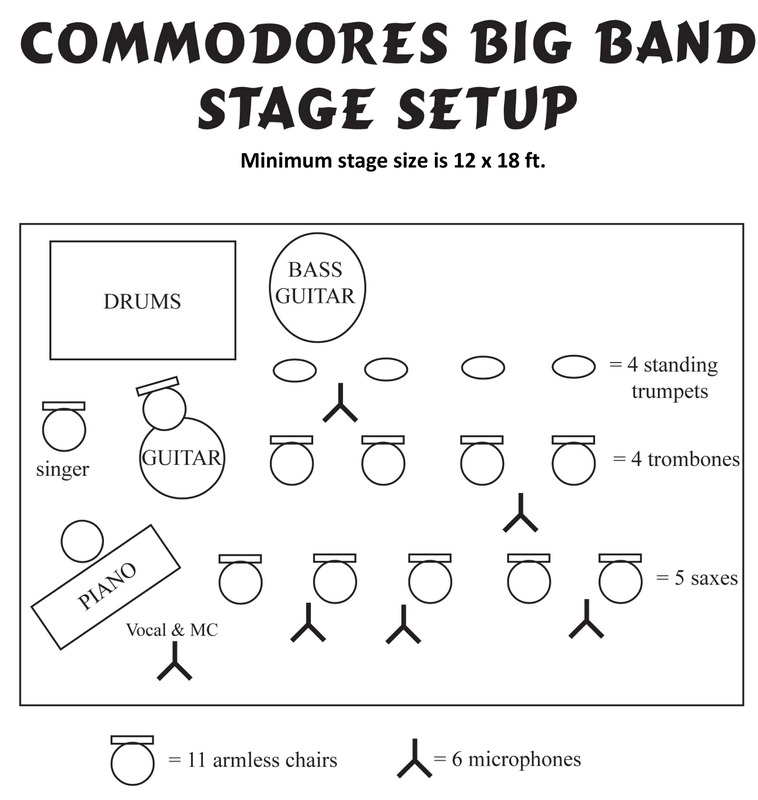 The Commodores Big Band do not perform with less than our regular complement of 18 musicians. The prices listed above are based on performances in the Greater Victoria area. Outside that area additional fees may be charged based on travel time, ferry costs, meals and/or accommodations. Additional charges may be applied for extraordinary staging, lighting and/or sound equipment requirements.